Immigration and Customs Enforcement (“ICE”) works with local law enforcement agencies to deport immigrants and separate families. 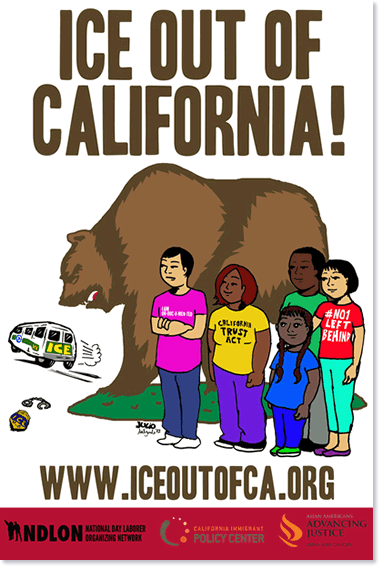 This website offers resources and answers frequently asked questions about the various ways in which local law enforcement agencies are entangled with ICE so community members and organizations can push ICE out of California. ICE access to local jails if they lack a criminal warrant signed by a judge. ICE access to local law enforcement databases. Information sharing between local law enforcement and ICE, including any  information related to an individual’s release date from criminal custody and  any personal information about an individual (e.g. home address, place of  employment, or future court hearings). ICE to question jail inmates about their immigration status. Responses to ICE hold requests or ICE notification requests. Transportation by local law enforcement of individuals to ICE. Denial or increase of bail for noncitizen detainees.